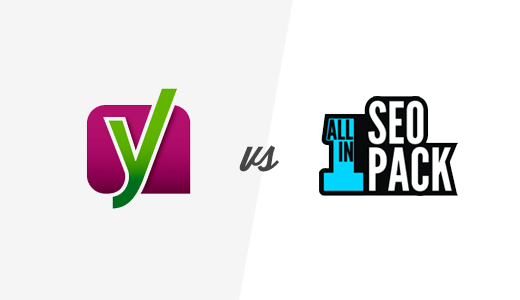 Yoast SEO vs All in One SEO Pack - Which is the Best WordPress SEO Plugin? WPBeginner» Blog» Opinion» Yoast SEO vs All in One SEO Pack – Which is the Best WordPress SEO Plugin? Are you looking for the best WordPress SEO plugin? If you are, then you have likely narrowed your choice down to the two most popular WordPress SEO plugins: Yoast SEO and All in One SEO Pack. At WPBeginner, we’re often asked which one is better? In this article, we will compare Yoast SEO vs All in One SEO Pack to find out which one is the best WordPress SEO plugin. Both All in One SEO Pack and Yoast SEO plugins have devout userbase, and they are among the most popular and most used WordPress plugins of all time. All in One SEO Pack was created in 2007 by Michael Torbert and Steve Mortiboy. Since then it has earned a massive user base and has become one of the most downloaded WordPress plugins of all time. Yoast SEO, started out as WordPress SEO by Yoast in 2010. It was created by Joost de Valk. With persistent and continuous improvements in the plugin, it soon became the major rival of All in One SEO. . These are both excellent plugins and offer all the must have features you need to get maximum SEO benefits on your WordPress site. Having said that, let’s compare Yoast SEO vs All in One SEO to find out which one of them is the best WordPress SEO plugin. It takes a lot of training and practice to understand and successfully implement the concepts of SEO into websites. A WordPress SEO plugin should make it easy for beginners to setup SEO best practices without any special skills. Let’s see how these two plugins stack up when it comes to installing and setting up basic SEO settings on WordPress websites. 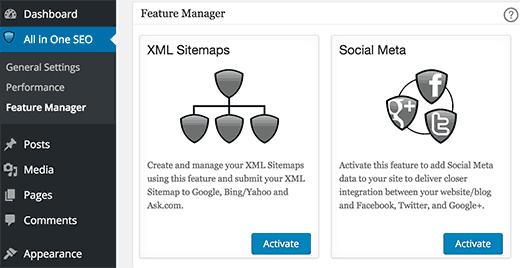 Upon activation, users can go to SEO » Dashboard page and launch the configuration wizard under the General tab. This will bring up a step by step wizard which will walk you through the setup process. This allows beginners to get started quickly without feeling overwhelmed by complex jargon and options. Yoast SEO is a powerful plugin, and it has a lot of options that you need to go through one by one. 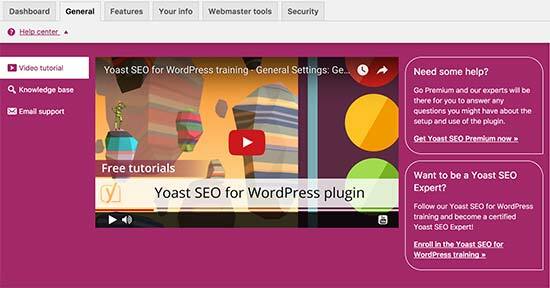 We have made this easy for you, take a look at our guide on how to install and setup Yoast SEO plugin in WordPress. The settings section of Yoast SEO is neatly divided into pages where each page has different tabs for respective settings. This makes it easy for users to locate an option in the settings. 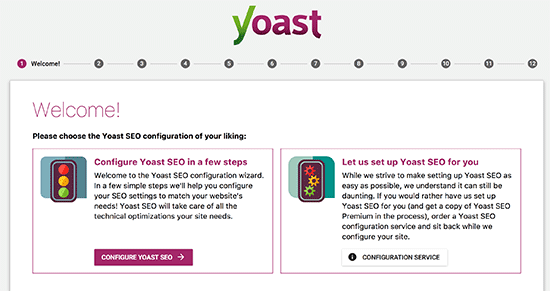 On screen help is available on all pages of Yoast SEO settings. Just click the purple Help button on the top, and it will expand to show video or text about the options on the page. Neatly organized settings, configuration wizard for beginners, and on screen help options make it super easy for beginners to setup Yoast SEO on their WordPress site. First, you need to install and activate All in One SEO Pack plugin. For more details, see our step by step guide on how to install a WordPress plugin. Upon activation, you will find the All in One SEO menu item just below the Dashboard. Clicking on it will take you to plugin’s settings page. All in One SEO Pack, has all the settings on a single page. This makes it look a bit overwhelming, but some users may find this approach easier and faster than the multi-page settings of Yoast SEO. The settings page is divided into different sections. Each section deals with the settings of a particular area or feature, for example: homepage settings, title settings, display settings, etc. There is a help icon next to each option. Clicking on the icon shows a short description and sometimes a link to additional documentation. This makes it easy for beginners to understand what they are doing. Here is our user’s guide for All in One SEO Pack, which will help you properly setup the plugin. Once you have carefully gone through general settings, you are ready to use All in One SEO on your WordPress site. Both Yoast SEO and All in One SEO has a lot of options. This makes the setup look a bit intimidating. Both plugins try their best to simplify things and make it easier for users to setup their SEO settings. We feel that Yoast SEO does a slightly better job than All in One SEO with their multi-page and tabbed settings. SEO is an ongoing process, and each new post or page you add to your website has its own SEO score. This means, you will be using your SEO plugin to optimize your content for search engines as you add it. See our guide on how to optimize your WordPress blog posts for SEO. Let’s see how our contenders stack up when it comes to performing day to day SEO tasks on your WordPress site. Yoast SEO comes with a powerful content analysis tool that helps you optimize every single post or page on your website. Just below the post editor, you will find Yoast SEO metabox with a snippet preview, focus keyword field, and content analysis. 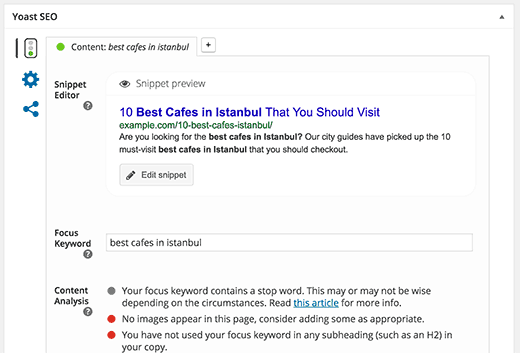 The snippet preview shows how your site’s title and description will look in search engines. 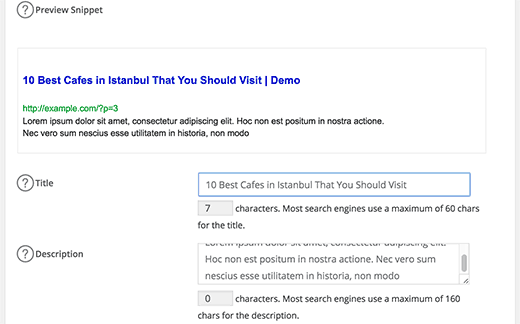 Yoast SEO automatically uses your post title as title and excerpt as description, but we recommend you to change it by clicking on the edit snippet button. Entering focus keyword in Yoast SEO will allow the plugin to analyze your content for that particular keyword. The analysis is shown in the content analysis area, where Yoast SEO will make suggestions on how you can improve your posts SEO score. The Yoast SEO meta box has two more sections. You can click on the gear icon to switch to the advanced view. The advanced view is something that most beginners should never use unless you know what you are doing. It allows you to stop search engines from following or indexing the post/page. Second, is the social icon that displays the social settings for your post. This is where you can set an article image for Facebook and Twitter. You can leave description and title bank because Yoast SEO will use your main title and description in the open graph meta tags. All in One SEO comes with a similar metabox to edit SEO settings on a post by post basis. 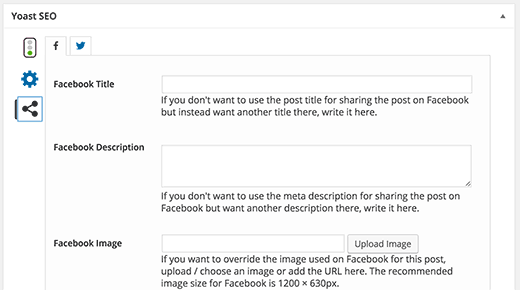 Simply edit a post and below the post editor you will find the All in One SEO meta box. 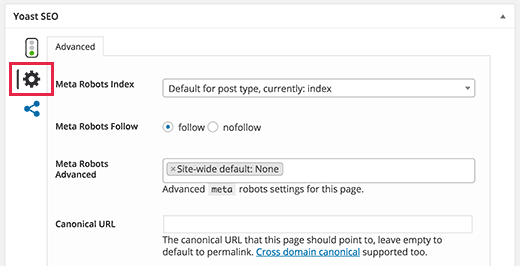 Unlike Yoast SEO, this meta box is very simple. You can edit the title and description, but there is no content analysis or SEO scoring. All in One SEO does offer advanced tools for each post which allow you to control indexing and following by search engines. It even has an option that turns off All in One SEO for that particular post or page. For social features, you will need to enable Social Meta addon by visiting All in One SEO » Features Manager page. 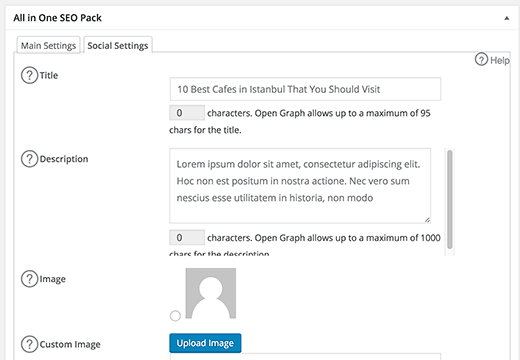 Enabling this addon will add a Social Settings tab in All in One SEO meta box below post editor. This addon allows you to set custom images and descriptions to be used by Facebook and Twitter. Both plugins make it easy to edit SEO settings on a post by post basis. All in One SEO Pack takes a lean and clean approach allowing users to add additional fields if they want to. Yoast on the other hand goes with decisions over options approach and add the features they believe is essential for all sites. However, we feel that content analysis, focus keyword, and SEO scoring gives Yoast SEO a big advantage. On page SEO is a comprehensive process that’s why both of these plugins come with additional tools and features aside from just meta tags. These features are there to eliminate the need to install several other SEO plugins and give you a true all-in-one solution. All in One SEO also comes with tons of features but some of them are not activated by default. You will need to visit All in One SEO » Features Manager to activate them. Both plugins offer nearly the same set of tools and features. All in One SEO does not have breadcrumbs navigation and importing data from Google Search Console features. However, not having these two features wouldn’t have any drastic impact on your site’s SEO. We also like how All in One SEO allows you to activate functionality only when needed. Even though both plugins are fairly easy to use and come with extensive free documentation, your free support options are very limited. Let’s see how both plugins handle professional support and addons. The basic free Yoast SEO plugin comes with no support, and you use it at your own risk. While you can ask questions at WordPress.org support forums and find help from other users, you are not guaranteed an official response from team Yoast. For professional support, you will need to buy Yoast SEO premium. Pricing for a single site license is $69, and it goes up as you add more sites. The premium license also comes with some additional features like multiple focus keywords, and a redirect manager. The free version of All in One SEO comes with no support. The All in One SEO Pack Pro version comes with one year of professional support. License for the pro version costs $97 per year for one site. WPBeginner users can get $20 OFF using our All in One SEO Pro Coupon. The pro version of All in One SEO is usually one major version ahead of the free plugin. It also comes with extra features like support for WooCommerce products, category SEO options, video XML sitemap, etc. Yoast SEO license is cheaper if you need it for just one site. However, prices go up as you add more sites. On the other hand, a single license of All in One SEO can be used on unlimited sites. All in One SEO and Yoast SEO are both great plugins so any comparison between the two plugins has to be very close. We personally use Yoast SEO on all of our websites and find it to be the best WordPress SEO plugin. It has more features to offer like importing data from webmaster tools, breadcrumb navigation, Your Info section, social features, etc. But the best feature is content analysis which we think helps a lot of beginners understand how they should write post titles, descriptions, and use keywords in their content. 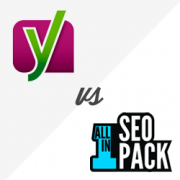 We hope this comparison of Yoast SEO vs All in One SEO Pack helped find the best WordPress SEO plugin for your site. You may also want to see our list of 9 best WordPress SEO plugins and tools that you should use. Please if I switch to all in one seo, will I need to edit all my post especially the keywords I used in yoast? You would want to reach out to all in one’s support for the specifics of what is transferred when you swap plugins for the answer to that. You don’t need to be a SEO expert to know YOAST will drop your ranking rock bottom on Google. I have no idea about Yoast but i tried working on my page professionally and calmly trying to get that Green dot but at the end of the day, I’m out of Google 5th page, even not using the plugin ranks me better than using Yoast. i have tried that on 6 different sites no luck. Yoast is only meant for SEO professionals, e.g like this site because they know how they write their blog posts, use keywords on the site etc.. believe me i came from clicking their page on Google on first page #1. like its a paid content from Google. My advise do not attempt if you not a SEO professional.. and to rank better naturally with Google do not use this fancy heavy CSS design sites. Google loves a basic lightweight site that has ugly user interface. I’m not sure what happened to your website, but Yoast is the most comprehensive SEO plugin for WordPress. They have done a great job in adding a setup wizard, so even the very beginners can setup their site for proper SEO. If you want maximum benefits from SEO, then you need to use a proper SEO plugin. tested SEO frameworks, awesome new plugins but i am still sticking with Yoast, there is a plugin to remove and strip down all the yoast banners and links. perfect combo for me. Well I read this article in hope to select between Yoast / AIOSEO but i am more confused than ever. I’ve noticed that Yoast provides SEO tools for categories for free, which All-in-One does only in Pro version. Furthermore, Yoast provide nice OG tags out of the box. So I decided to return back to Yoast after a short romance with All-in-One SEO. Both in one and Yoast do not have a redirect option. I’m missing that. First of all, Yoast configuration is hell, any mistake u make will really hot your ranking and post title and meta tags always have issues. I currently use AIOSEO on my site and my ranking on Google, Bing and Yahoo has improved immensely. 18% of my daily visitors come from search engines, thanks to AIOSEO. Yoast will constantly botch your titles, I mean constantly. Joost will say it’s google despite AIOSEO never having this issue. Okay, I have tried both of these seo plugins and I must be honest Yoast is bloat ware that will drop your google ranks. At the time I was using a free version of AIOS and moved to yoast. Sadly my ranking fell from the frontpage. All the readability stuff and yoast scoring will hurt more than it will do good. Even the google snippet wouldn’t work correctly. I just went back to AIOS and my rank went back up and my google snippet is spot on h1 ahd h2 tags are working as intended. just my 100 cents. Hi can I am using both at the same time, is that a bad thing? Yes, it is not good and you may face serious SEO and performance issues. Please select the one you like and deactivate other plugin. Here’s a problem with Yoast, at least when used with WPEngine as your host. It does something that causes links with unsafe characters to be sent to the host. If WPEngine sees enough of those, they lock out your IP right then and there. The net result is I have lost 2 blog posts and the work that went into editing them because of this. I don’t know if it is a Yoast problem or a WPEngine problem, but it’s a problem! Any plugin or hoster that allows me to enter a link that causes this kind of lockout and subsequent data loss is just a very bad thing. I don’t know if other hosters will have the same problem, but Yoast and WPEngine at the very least need to figure out how to fix it. My company’s WordPress site is having a similar issue as well. While editing in a post we are disconnected and locked out of the site for 10-15 minutes. This problem only occurs when Yoast is activated. Yoast Support knows of this issue and has told me it is out of their control and to check with my site’s host. However, our site is hosted with InMotionHosting and they have investigated this issue in depth, and conclude the problem lies within Yoast. Any help much appreciated! Wow!! Very transparent Review, Thank you! I also preferred YOAST SEO. Thanks for the great review. I will use Yoast SEO plugin for my blog. Im a newbie blogger in wordpress website how can i get premium seo? I will actually recommend yoast SEO to all in one. It is very amazing and can boost your overall score. Can you help me please sir im still confuse! I like All in 1 but please advise me if I observed wrong but It seems like it is only for Blogs? I am not a fan of Yoast yet but might have to adapt if I can not find a tool/plugin I can use for my WordPress Website. We do blogs too but I really was looking for a tool for our client websites more so. Any advise and or recommendations would be appreciated. Yoast SEO does no work at all when it comes to PHP 7! It is clashing with woocommerce, giving errors that makes the system crash. After trying to contact support all I hear is that woocommerce is the problem. Thank you very much for this post, it is very informative and does a lot to me and others generally. But I think, for a beginner and novice like me, AiO should be the choice, or is there any one of such level I should go for? Thank you. I am intrigued by SEOPressor, it looks pretty good, although I don’t believe the prices page, based on features it has, and competitors do not. wpbeginner, can you do a review with SEOPressor and the two above ? I really appreciate this article. I am new to SEO, although I have known about it for some time. I am finally attacking the web with a honest effort to earn some income online, so I am learning EVERYTHING: WordPress (it’s a DEMON! ), SEO/online marketing (a lesser demon, but still…) and various other things related to creating a viable online presence. So I searched comparisons and found this. Now it’s a toss up, but I feel everyone is leaning on Yeost, so that is what I am doing. I’ve been using Yoast for a few years and I like it overall, but I’m getting pretty tired of their new “readability” scoring. Unless you use absolutely bizarre sentence structure and dumb your content down for morons, you’ll never get a green “good” score. People should know to sprinkle in key phrases in the title, description, and content, before there was a calculator (ya know, how like everyone used to do it?) The content analysis calculator is often inaccurate as well when Google makes updates. Also AiO beats Yoast for mass edits, the way AiO does it from the pages/posts page (where you can view as much as you want in the options of that administration page) vs how the Yoast mass editor tool does it INSIDE Yoast itself and only allows like 10 pages to be shown at a time? the payment for hosting a web is too much! why dont satrt such payless alternative for student and poor socities? The cost of hosting a site is not expensive at all. I pay £50 a year to host 10 sites. Your comment isn’t even relevant to the article. Can you mention the hosting provider you are using for your 10sites? This is a good compare analysis, after reading this information i realize there are some fitur Yoast SEO that I never use before. Specially on advance menu the social settings, sometime when i share article on facebook, the image preview not show in a big picture so my article does not have a big impact to reader. Now I use both All in One SEO Pack and Yoast SEO plugins together. Yoast SEO for content analysis tool and All in One SEO to generate meta description and keyword. Hello can i use both together? No,You can not use both together. Should the the option to modify how your image behaves on FB and twitter be a great deal in All in one SEO? is there any similar option ( or addon) in free or premium version of Yoast. I think this is a good question for someone who is looking for either one of these. It does for me. Neither! I would say after testing many SEO plugins, I would rather opt for SEOPressor. Their new redesign with expanded capability prove this to be the far superior plugin! If I had to choose between Yoast and Allin1, I would pick Yoast, but when you add up all the advanced capability upgrades for Yoast, your better off with SEOPressor for a better price imo. I find SEOPressor quite unserious. They only offer ClinkBank payment for ones and their support is terrible.